LASP will serve as the Science Operations Center for a NASA mission launching this month to better understand the physical processes of geomagnetic storms, solar flares and other energetic phenomena throughout the universe. The $1.1 billion Magnetospheric Multiscale (MMS) mission will be comprised of four identical, octagonal spacecraft flying in a pyramid formation, each carrying 25 instruments. The goal is to study in detail magnetic reconnection, the primary process by which energy is transferred from the solar wind to Earth’s protective magnetic space environment known as the magnetosphere, said LASP Director Daniel Baker, Science Operations Center (SOC) lead scientist for MMS. “Magnetic reconnection is a process in which energy stored in a magnetic field is converted, generally explosively, into heat and energy in the form of charged particle acceleration and large-scale flows of hot gas, or plasma,” said Baker, also a Distinguished Professor at the University of Colorado Boulder. LASP Mission Operations and Data Systems Director Bill Possel said all of the data downlinked from the four spacecraft will be captured, stored and distributed from LASP’s SOC. “Our job is to get it out to scientists as quickly as we can,” said Possel. In addition, the center will be responsible for uploading commands and monitoring 100 instruments on the MMS mission—25 on each spacecraft. “We already control four spacecraft and 15 instruments in space, but this will be a big jump up for us,” Possel said. 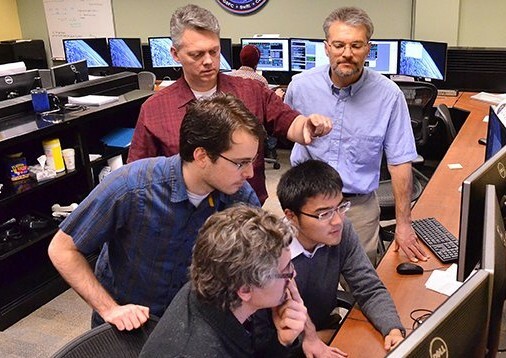 Possel said the students—some of whom even created software tools to help upload commands to the spacecraft—will work 4-hour shifts in the SOC, located in LASP’s Space Technology Research Center, as they monitor the spacecraft day and night during the six-month checkout period. The mission, expected to be worth more than $15 million to CU-Boulder in NASA funding, is slated to run at least another two years after that. Junior aerospace engineering sciences student Evan Grazer, who is on the MMS instrument control team and also helped to develop software for the mission, said the students are currently conducting “dry runs” to get ready. “We are the ones who will be at the consoles, sending instrument commands and working closely with the flight controllers, so we want to learn how to be as effective as possible,” he said. MMS is slated to launch March 12 from the Cape Canaveral Air Force Station in Florida. While scientists are very interested in the basic science behind magnetic reconnection, understanding more about it also should help them better understand space weather events on Earth. This includes the effects of solar flares and coronal mass ejections, or CMEs, which can contain billions of tons of solar particles in the form of gas bubbles and magnetic fields that explode off the sun’s surface and hammer Earth, interfering with GPS satellites, power grids, radio communications and threatening astronaut health. The four spacecraft, which will be stacked like giant pancakes on the Atlas V launch vehicle built by United Launch Alliance of Centennial, Colorado, will fly in formation in an elliptical orbit that will place them within several miles of each other. The key to the mission is the cutting-edge capability of the spacecraft, which will be taking enormous amounts of data from both a telescopic and microscopic perspective, said Baker. The instruments can produce a 3-D image of electron plasma by recording points of data every 30 milliseconds—more than 10 times faster than the blink of an eye. Each spacecraft will carry identical suites of plasma analyzers, energetic particle detectors, magnetometers and electric fields instruments. “The instruments will help scientists locate and zoom in on small, rapidly moving magnetic reconnection regions, showing this important environment around the Earth at a level of definition not previously possible,” said SOC Manager Chris Pankratz of LASP. Pankratz began working at LASP as a student satellite controller for the Solar Mesosphere Explorer in the 1980s. For the mission, LASP also contributed an electronics package known as the Digital Fields Board, which is the “brains” of the Electric Field and Waves Suite on board each spacecraft. The LASP electronics package will help select and compress data using two fixed antennas and four extendable wire booms, each roughly half as long as a football field, said LASP’s Robert Ergun, who is leading that effort. During the first half of the mission, the MMS spacecraft will fly in a highly elliptical orbit between about 4,400 miles and 47,000 miles in altitude. The spacecraft orbits will eventually be extended to about 93,000 miles above Earth. Possel said the science operations team at LASP will be in close contact with NASA’s Goddard Space Flight Center in Greenbelt, Maryland, which will be controlling the spacecraft. Jim Burch of the Southwest Research Institute in San Antonio, Texas, is the principal investigator of the MMS instrument suite.